Given 2 brainfuck code snippets A and B, output some brainfuck code C which has the same behavior as running B with the input of As result. Note that C must work for any input that match the following assumptions, as if it were given to A.
both A and B halt. EOF is consistently 0 or consistently -1. Code A and B can contain characters that possibly appear in your C, and +-<>,. Shortest code in each language win. Winner in Brainfuck will be accepted. With respect to A, B, and C: EOF = 0, cells left of start disallowed, 8-bit wrapping cells. Expects A followed by ? followed by B. The VBA code changes the brainfuck code in a way, that the output of snippet A will be stored in a list and the input of snippet B will be read from that list. This is my source for the brainfuck portions of the code. I will explain that in detail later. Output for test case 1: f ",[..,]",",[...,]"
Output for test case 2: f ">,[>,]<[.<]",",[...,]"
Output for test case 3: f ",.",",." Complex test case: Snippet A: Build alphabet triangle >+++++[<+++++>-]<+[>>[>[.>]]>++++++++++.--[<++++++++>-]<[+.<]<-]>>,>[.>]++++++++++. [<[.<]>,>[.>]<] Try it online! Snippet B: Sort input in ascending order >>,[>>,]<<[[-<+<]>[>[>>]<[. [-]<[[>>+<<-]<]>>]>]<<] Try it online! Here it is! The brainfuck code that composes two brainfuck codes. Use a "!" to separate the two input code snippets. For example snippet A: >,[>,]<[.<], snippet B: ,[...,]. Input for my program: >,[>,]<[.<]!,[...,]. It will not terminate if no "!" is found. This does essentially the same as my VBA Version. The code that is generated is the same as in the VBA version (note that the examples in the VBA post were made before the latest change in the brainfuck snippets). ->[-]++++[-<-------->]          decrease input by 33 to check for "!" # A check for "!" <[                              if input not "!" # A check for "dot"
# A check for "less than"
<<<----- ----- ----             decrease input by 14 (total 60) to check for "less than"
[                               if input not "less than"
# A check for "greater than"
<<<--                           decrease input by 2 (total 62) to check for "greater than"
[                               if input not "greater than"
# B check for "less than"
<<<----- ----- ----- -          decrease input by 16 (total 60) to check for "less than"
# B check for "greater than"
To split A from B I opted for /. The actual code that generates this is just a read-loop with a flag for A/B and a switch that reduces the input to look for >, <, /, ,, and . and otherwise just output the input. It is actually just a transpiler where the transpiled code lives within a data structure such that it don't interfere with the stored data from A or each other. The / just moves the active cell to the first unused cell. I originally cleaned it up, but that makes the program and output larger. The c is crumble. cz is always 0 It points out where in my emulated BF data the pointer is. The active value is -1 while all visited cells will have 1. In operations like aprint and bread some c get special meaning. A-code print skips all cells 1 byte to leave room for one more byte input which is copies with a backup in the next bytes crumble to copy back. B-code read fetches input from input. Here being destructive is ok and when you "read" the last byte you get 0 as EOF regardless of the implementation. For flavors with EOF = 0, cells left of start disallowed, 8-bit wrapping cells. Expects program A on the first line and B on the second line. This uses 2-cell nodes to simulate the tapes of A and B, with A's output occupying contiguous cells to the left of the leftmost node. Originally my design was based on a doubly infinite tape, which required significantly more work to move left (moving data when passing beyond the leftmost cell previously encountered) and to transition from A to B (clearing the data instead of just traveling past the rightmost cell previously encountered). Thanks to Sylwester and Dorian for tricks and ideas. Not the answer you're looking for? 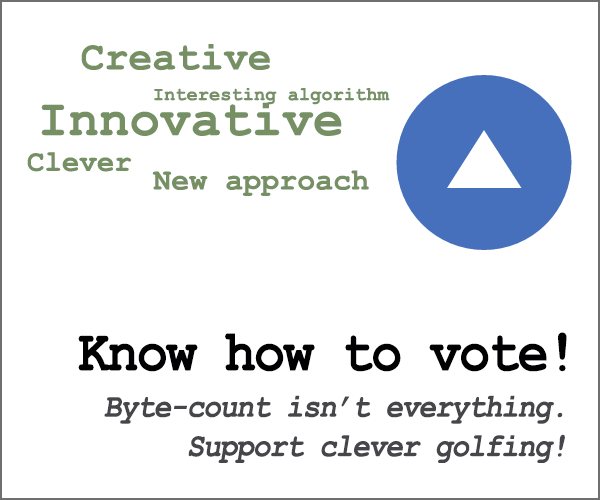 Browse other questions tagged code-golf code-generation brainfuck or ask your own question.